House of Bourbon: Vacation Day 3- Jamaica Mon! The only thing better than going on vacation is living vicariously through someone else's vacation pictures. So, now that I have my computer back, and have reloaded my photos (back up your hard drives, people!!! ), I'll continue sharing vacation pictures. Aren't you lucky! The water in the Caribbean is beautiful. I could have taken pictures of it all day, but we had plans. Off the boat and onto a bus we went. The juxtaposition between the very rich and the very poor was shocking. In America, the very poor are hidden in inner cities or in the middle of country, where no one can see them unless they go looking for them. In Jamaica, the large beautiful houses were right beside the shacks. In America, zoning restrictions keep this from happening, for the most part. It was cool to see goats and chickens everywhere. In my perfect world, livestock would live in harmony with humans. Azaleas are known as fence plants. When I formed my bucket list, I put visiting museums on it. I suppose I should have put visiting 100 caves. We love caves, and find caves to visit on a regular basis. Jamaica was no exception. The Green Grotto Caves were once home to a bar. They decided the vibrations from the music were not safe and shut down the bar. They use to fight crabs on this circle in the bar. 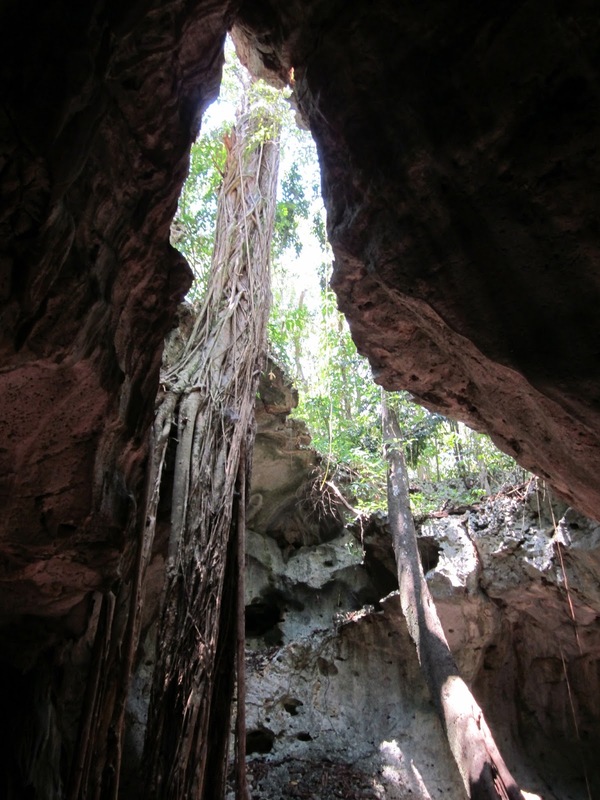 The caves were used for many purposes, including slaves running during the uprisings. I can't imagine attempting to escape through a dark cave, never knowing if your next step will sink you into an underground lake. 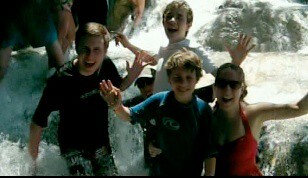 After the cave, we headed to Dunn's River Falls. 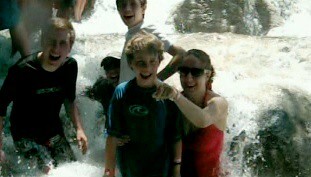 Climbing Dunn's River Falls was one of the highlights of our trip. Dominic was terrified, but made it almost to the top before he got out. Once he realized how close he had been to the top, he was disappointed he didn't make it all the way to the top. That was important when it came time to climb the Mayan pyramids. He didn't want to have that regret again. Trying to use his Disney Princess Eyes to convince me to let him play video games on the bus ride. While in Jamaica, drink Jamaican beer.